It's been a finchy winter in the northland. Earlier in the year there were lots of crossbills hanging around, and although none of them came to my yard (I do not, admittedly, have the most crossbill-friendly yard) I did get to see them on hikes and such. And then later in the winter into early spring, there was a redpoll and siskin explosion, and everybody on the bird lists was reporting huge numbers of them. 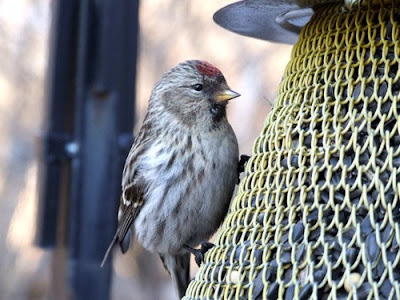 I was all excited about my six redpolls during the GBBC in February, but by late March and early April, I was having 30+ (and sometimes 50+) finchy birds in my yard, mostly Common Redpolls, and a handful of Pine Siskins, and at least one or two Hoary Redpolls. Before this year, I never had very many finches, so I only have a tiny thistle feeder, maybe eight inches tall, and they were cleaning it out everyday, sometimes twice a day, plus they were doing a number on my sunflower and mixed seed feeders. I guess I was out there refilling the feeders often enough that they got used to me, and I could literally walk right up to the feeder, within about 18 inches, and the birds still kept flying in and out, making their chirpy, musical racket. (I tried coaxing them onto my hand, but they weren't quite that bold.) So one day after I filled the feeders I went back out with my camera and got these shots. That's a siskin on the left and two redpolls on the right. And a goofy one, too. 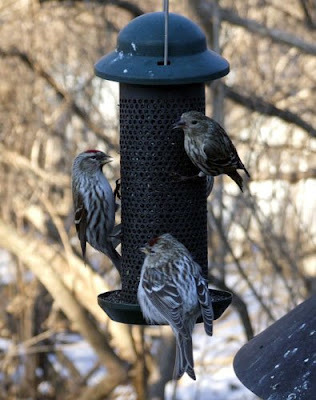 That's a healthy redpoll and siskin up top, but the redpoll on the bottom that looks poofy and droopy ain't doing so hot. So, to try to keep the other birds from getting sick, I did the "right" thing and let the feeders go empty and then washed them out with a 10% bleach solution. 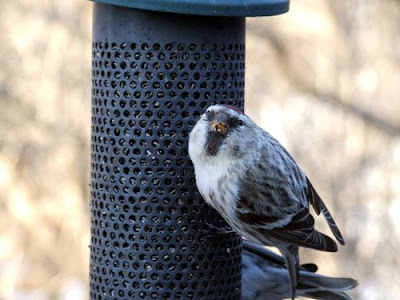 And then you're supposed to keep the feeders empty for a few weeks so that the sick birds either die or fly away... but it's migration season, and I can't bring myself to leave the feeders empty that long, so I filled them up again after a few days of being empty. That was yesterday, and today I saw one siskin and one redpoll, but I think the big flock has dispersed. 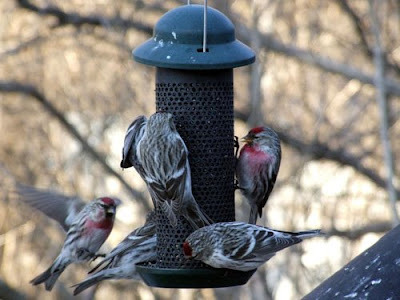 Redpolls spend the summer up in the tundra, so it was getting a bit late for them to be hanging around Duluth, anyway. Still, the yard seems awfully quiet now without them. 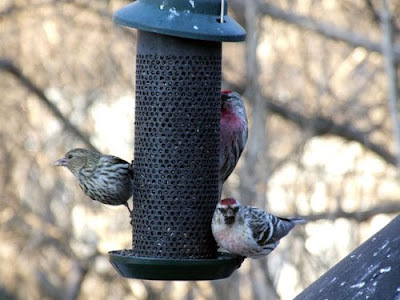 Wow -- I've tried taking pictures of finches at feeders and never got anywhere near that close. Thanks! Yeah, it was wild--they let me walk *right* up to them. I could have grabbed one and put it in my pocket if I wanted.